We are one of the major manufaturers of Destination display boards in India.These are used in busses, trains, cabs and other vehicles. Luminosity of LEDs used allows for daylight viewing. Versatile and user friendly s/w for composing destinations in different languages. Available in Red and Amber color. User interface with full keypad allows random selection of destinations. User interface module is designed to send destination information to a maximum of 16 display modules in a vehicle [one can have destination shown on front, rear, side and inside the vehicle]. Compact hand held Data Cards allow easy upgradation of station names. Versatile image making s/w free of cost. Provision to set variable time slot duration for each message. Allows up to a maximum of 12 graphic images to be stored in board memory. Board sizes in multiples of 48 x 16 pixels. Two line alphanumeric displays having dot matrix display modules of 8x8 pixels. They are available in 96x16, 144x16 pixel sizes. The keypad consisting of 20 feather touch keys provides for making messages like it is done with hand phones to create SMS and composed messages can be stored . Upto 100 messages can be stored . User friendly keypad similar to hand phones. Designed to be used in industries , common waiting halls like Airports, Railway Stations, Hospitals etc. It has 4 digits of six inch seven segment displays with super bright LEDs (each segment is made of 4 pixels with 4 LEDs in every pixel). Operates either in 12hrs mode or 24hrs mode. Two keys SET and ALT on front panel are to set the time. Provision to set time through PC COM port or any RS232 Port . Used in the manufacturing industries to display production details on the assembly line. Production details such as TARGET COUNT, ACTUAL COUNT, and DIFFERENCE will be shown on the Display. Monitors production rate of production line. Operators can set target, break and lunch time. Control unit automatically updates progressive target count with time. Displays the achieved target count on every input pulse. Display size - 4" seven segment display. Target indicator- 3 digits, Achived - 3 digits. Difference indicator - 3 digits.Repair Count - 2 digits. Over all dimension (687mm x 380mm x 100mm). OTPI is a microcontroller based device designed for use in Hospital Operation Theatres to keep track of the time elapsed during Operation and to monitor the Environmental Parameters like Room Temperature and Humidity. It is also housed with a Digital Clock. Uses 2” Super bright seven segment LED displays. Three digit display to indicate Room Temperature, two digit display to indicate Humidity in the room.Six digit displays are used in Digital Clock to indicate Hours, Minutes and Seconds . Alarms for each parameter can be set so that on crossing of the set values it will generate the alarm e.g. The feature may help in getting early warning before it is time for the patient subjected to anesthesia to regain consciousness. 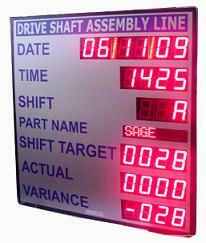 The display uses 4" LED Display units of 8 Nos to show different production Line parameters. Over all dimension (1280mm x 800mm x 100mm). 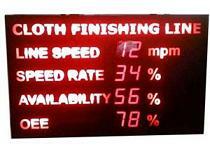 Static information display is illuminated by back light with uniform intensity. Designed to work with remote PLC at a distance of 3kms. It Displays time and also it can announce a pre-configured voice message for eg : " Wash your Hands " for the pre-set time interval .Suitable for use in hospitals, railway stations, banks and public places. It is a complete solution for Queue Management for hospitals with a set of smartly designed components. Hand Held Unit : which will be operated by doctor to call patients. Waiting Hall Displays : to show token numbers in waiting halls. Door Displays : to show name of the Doctor occupying the room. Nurse Station Displays : to show Doctor's name seeking help.